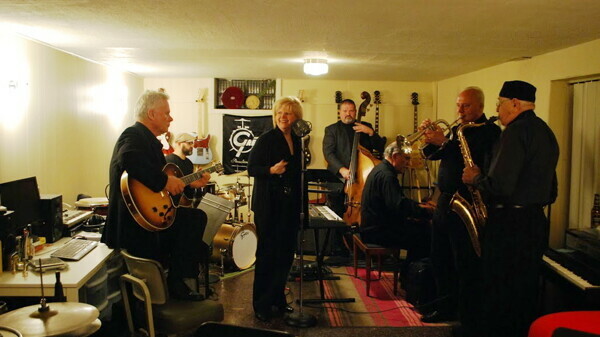 Liscio, composed of veteran Chippewa Valley music teachers and performers, focuses on traditional jazz styles such as R&B, delta blues, Latin, and New Orleans jazz. Whether it’s funk bands playing at the bars, college jazz combos playing in coffee shops, or even a live big band playing the hits of the ’40s, in a musically enlightened area like the Chippewa Valley you can find just about any style of jazz. But Ken Rogers and Dave Mueller saw a void in the scene, and they have filled it with their jazz group, Liscio. Playing traditional styles like rhythm and blues, delta blues, Latin, and New Orleans jazz, Liscio consists of seven members from the community who have experience as performers and teachers. That stellar cast of musicians includes Lyle Heck on saxophone and clarinet, Mueller on fluegelhorn and trumpet, Gordon Murphy on keyboards, Steve Clay on bass and tuba, Rogers on guitar and banjo, Brad Stoughton on drums, and Roxanne Litchfield Holly handling the vocals. They can often be found gigging at the Acoustic Café and From the Vine, but Liscio has been performing all over the Chippewa Valley since February. Although the members come from musical backgrounds that range from the West to the East coast, they have all found a home in the Chippewa Valley and are bringing those experiences and talents together to form a group that is very different from any other in the area. “Everybody bends a bit in this group, that makes it fun,” he added. Liscio will perform at 7pm Friday, Nov. 15, at From the Vine Wine Room, 2526 Golf Road, and at 7pm Saturday, Nov. 23, at Acoustic Café, 505 S. Barstow St.